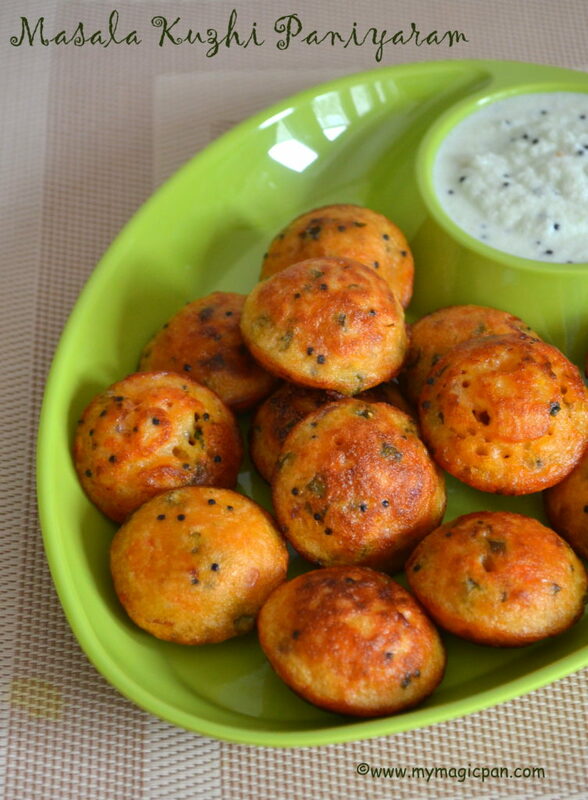 Masala Paniyaram is a simple snack made from left over idli/dosa batter. When the batter becomes sour or old I make this. 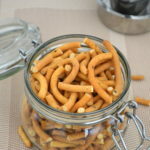 It is a simple recipe which can be made without any prior preparation. Can be had for breakfast/dinner too. 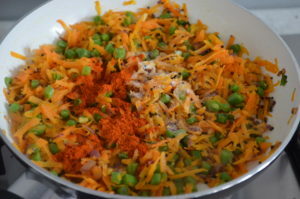 Perfect for kids as it has a good dose of vegetables and looks colourful/attractive. 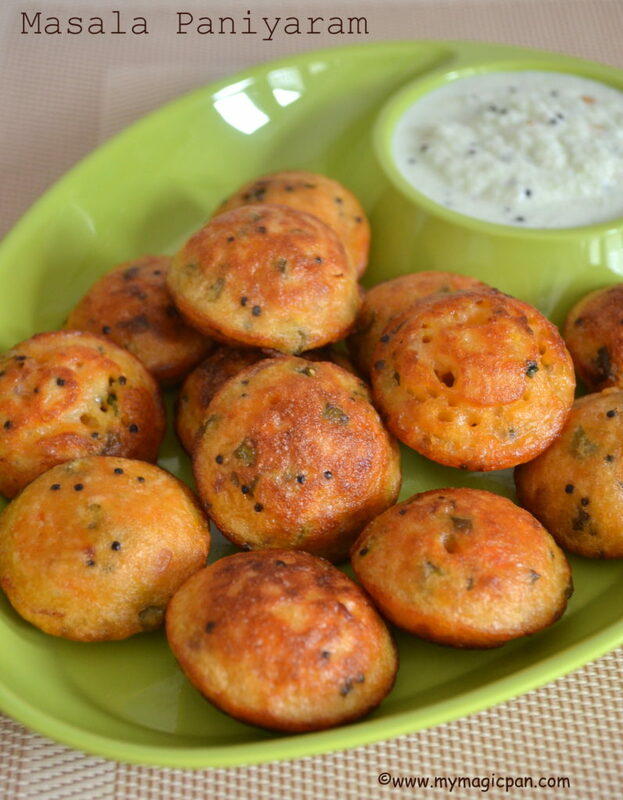 I have already shared the traditional recipe of kuzhi paniyaram before, this is a quick & instant version. 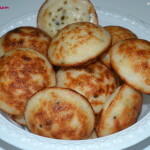 If u are looking for sweet verions of paniyaram check this or this! Chop the onion, ginger & beans. 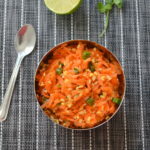 Grate the carrot and coconut. Keep everything ready. 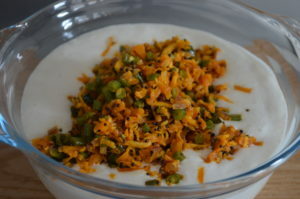 Heat a pan with oil and temper with mustard/urad dal. 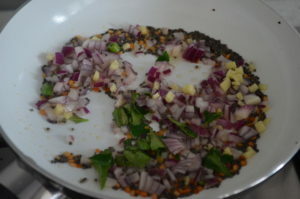 Add the finely chopped onion, ginger & curry leaves. Saute until onion is translucent. 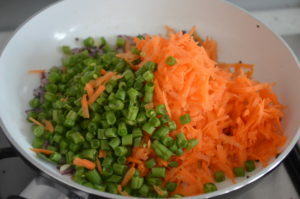 Add the grated carrot and beans. Add salt and chilli powder. Cook until soft. Finally add the grated coconut and coriander leaves. Saute for a few seconds and switch off. 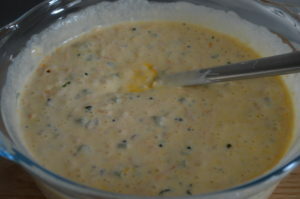 Transfer the veggies to the batter once it cools down. Mix the batter well. 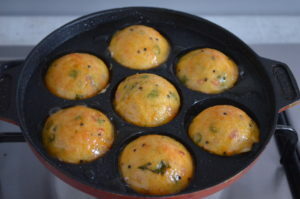 Heat a kuzhi paniyaram pan and pour oil in each hole. 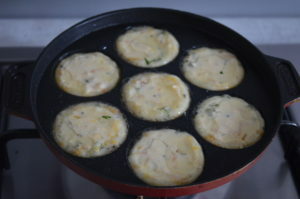 Once it is hot, pour a ladle of batter in each hole. Flip and cook evenly on both the sides until golden. Thats it! 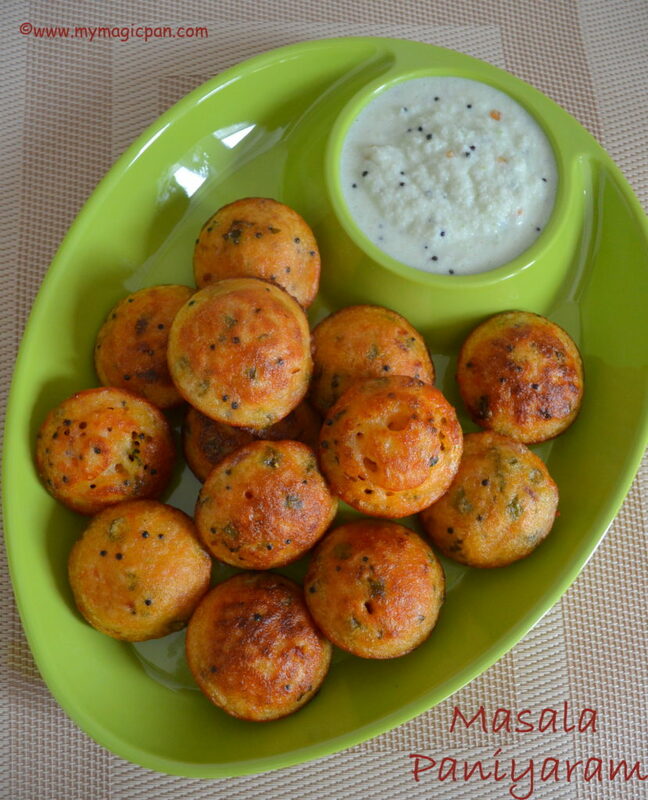 Simple and yummy Masala Paniyaram is ready! 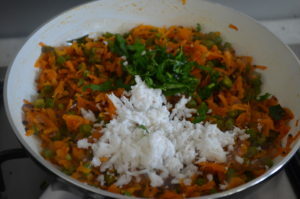 U can add finely chopped green chillies. I did not add as Chotu does not like it. 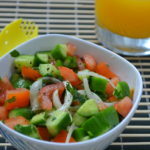 U can add any veggies of your choice. 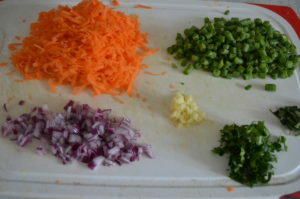 Make sure it is finely chopped. 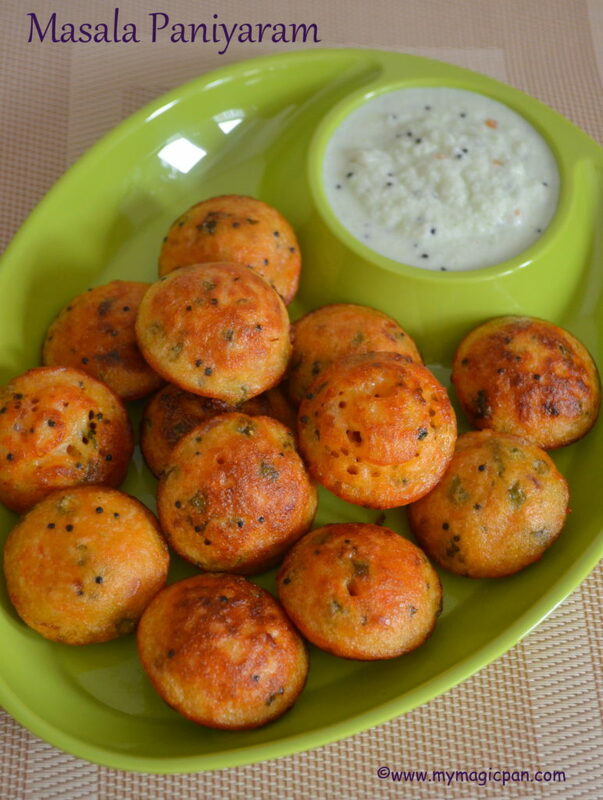 Cook the Masala Paniyaram in medium flame for even cooking. Else it will be brown outside and un-cooked inside. Coconut is purely optional. U can skip it. Love the colour and looks very tasty.